Other psychological disorders [Section 11] If another disorder is leading the person to be anxious, we may be able to treat that problem and relieve the patient’s anxiety in the process. In that case, we can stop. However, it may pay to have a follow-up [Section 47] at a later date, to be sure. Phobias [Section 14] Treatments may differ for different kinds of phobias. 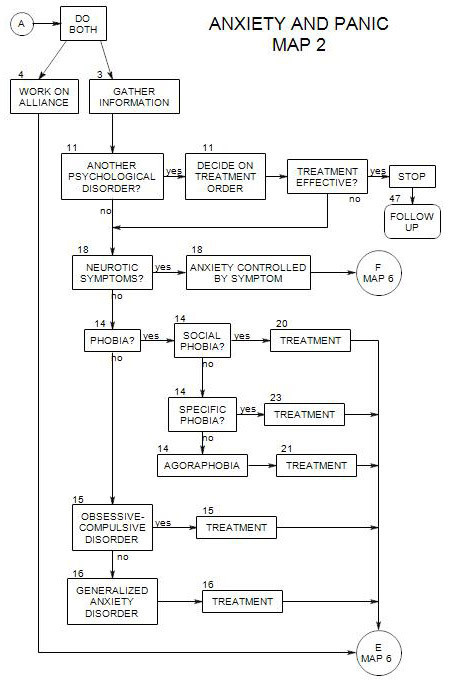 Treatment of social phobia is considered in Section 20; treatments for specific fears are discussed in Section 23, and agoraphobia is discussed in Section 21. Although specific treatments are associated with some of these diagnoses and symptoms, there are some general treatment approaches as well. These are considered in .